These lists provide insight on how to control our impulses and act with intention – while we may be drawn towards that second cup of coffee or get wrapped up in an office feud, we can help ourselves by focusing on cultivating good habits and striving for wellness. On the topic of impulse and intention, author and pastor Andy Stanley has developed an approach that builds on the ideas discussed by Bradberry and helps us go beyond categorizing behaviours under DO or DO NOT labels. In his book, The Principle of the Path, he discusses the concepts of attention, direction, and destination and their application in many areas of life. His premise: Your attention determines your direction, and your direction determines your destination. The idea that attention determines direction is nothing new, it’s why we warn kids to watch where they’re going, or tell drivers (not always so gently) to focus on the road. We know that where the eyes go, the feet will follow. Stanley continuously makes this seemingly obvious (yet easy to ignore) point: your direction, or your path, determines your destination. If you want to be fit, but you never exercise and ‘treat yourself’ daily, you won’t get fit. We can’t expect the results we desire if we don’t follow a path that will lead us there. Our life is full of destinations. What do we want to get done today? Where do we want to be in five years? What do we want written on our tombstone? Whether our destination goals are tangible (financial savings, adventure travel, early retirement) or intangible (great relationships, career expertise, spiritual fulfillment), it’s important to think about what they are, and how to get there. Leaning on Bradberry’s article one last time, we can think about reduced stress as a destination. Most of the DO and DO NOT advice he offers is not surprising – we can see what we should focus our attention on, what we should steer our attention away from, and how those choices will lead to stress reduction. Given this path, we can check in with ourselves whenever we feel an impulse and ask: Will this lead me to where I need to be? Stanley’s advice boils down to this thought: The small things matter. Maintaining attention matters. Intentionality matters. If we want to get to our d?esired destinations, we need to be aware of how we divide our attention, and how that guides our direction. Every time we lose our attention (when our intention is to give it somewhere else), we delay getting to our destination. In other words, take the path that leads you where you want to go. Let’s face it, few people approach the mediation table with unbridled glee. If you’re a party at a mediation session, it often means you’ve suffered in some way – be it financially, emotionally or physically. Some parties struggle with pain (physical, psychological, emotional); others have seen their lives turned upside down by financial hardship. While mediators do their best to address and minimize the suffering, there are some things we just can’t fix. Constant exposure to tragic circumstances can be hard to cope with, and some mediation participants may find themselves mentally detaching from the pain they witness in others. This disconnect is often referred to as ‘compassion fatigue’. Compassion fatigue is defined as a gradual decrease in compassion experienced by professionals who witness trauma regularly. Compassion fatigue serves as an unconscious coping mechanism – the brain’s way of protecting itself from the emotional stress of exposure to trauma. Although compassion fatigue may provide temporary relief from emotional stress, long-time sufferers often experience burnout. We often think of medical professionals – nurses, surgeons or psychiatrists – who are regularly exposed to and treat physical and psychological wounds left by trauma, as being at the highest risk of experiencing compassion fatigue. But, this condition isn’t reserved for the healthcare field. Mediators, lawyers and mediation participants are also at risk of experiencing compassion fatigue. I see compassion fatigue on display most often in the mediation of personal injury cases, although it's certainly not unique to that area. Insurance adjusters, faced with a steady stream of chronic pain claims, based exclusively on soft-tissue injuries, with no objective evidence of physical deficits or injuries, become numb (and jaded) to even legitimate and honest claims of suffering. There are psychological and physical signs of compassion fatigue, and it’s important to be able to recognize them in all mediation participants. Below is a list of symptoms sourced from Compassion Fatigue Solutions, a consulting firm based in Kingston, Ontario. At its core, compassion fatigue is a coping mechanism. If you are recognizing compassion fatigue in yourself, it may be a sign that you need to find healthier ways of coping with exposure to suffering. Below, I offer a few approaches to help manage and recover from compassion fatigue. Develop a Self-Care Plan: Medical researchers John-Henry Pfifferling and Kay Gilley have developed a resource for medical professionals experiencing compassion fatigue. They recommend developing a self-care plan that helps reduce stress and meet emotional needs. They suggest spending quiet time alone, finding a way to recharge every day, and having at least one meaningful, connected conversation each day. Establish Professional Boundaries: Compassion fatigue can infiltrate your home and personal life. Establish professional boundaries to create space for yourself away from your work. At the end of each work day, commit to a routine that definitively ends your work time – sign out of your work email, turn off your work phone and record the time to make it real. In the age of 24/7 connectedness, it may be easier said than done, but these small conscious actions may help ground you in the present and remove you from work worries. Attend a Workshop: There are many organizations out there dedicated to compassion fatigue recovery. In the Toronto area, the Canadian Mental Health Association lists one organization that offers assistance for those suffering from compassion fatigue. If you’re struggling with compassion fatigue, I encourage you to find a workshop near you. One day a couple of weeks ago, I conducted a 7-hour mediation, zipped into my office for an hour, and then picked up my son from home before driving through the snow to his hockey game. I sat down on the couch at the end of the day at almost midnight. This is one of many such examples where the day seems to be spent travelling from one place to the next until, before I know it, it's over. Sound familiar? I love my work, my family, this Canadian weather and, of course, hockey, but with all the rushing around in life, being present and in the moment is becoming more and more challenging. At times like these, I need to remind myself to stop looking ahead to the next thing, and keep my feet firmly planted in the here and now. Don’t Fear Full: It could be that there are some things in your life that you should shed, but don’t think you need to do less to be present. A full schedule that can sometimes feel overwhelming is also a smorgasbord of experiences and opportunities. Rather than skipping the things that you love to do, urge yourself to really enjoy them when you do get the chance. Do it all, and do it well. Plan Ahead: Many things in life can’t be planned for, which is all the more reason to prepare for the things you can. If part of your struggle stems from feeling like you’re constantly squeezing in to-do list items, try planning them in advance. Eliminate some of the stress that can draw you away from the present by knowing you have a plan. Set it, and forget it. Grow Your Wealth: Think of your experiences as wealth. Moments lost to stress or distraction may be lost earnings, but they don’t take away from what you’ve already deposited. The more you are able practice presence, the richer your experience bank. Practice Makes Present: Don’t get down on yourself when you realize you’ve been pulled from the present; instead, take a moment to regroup and refocus. The more you integrate a habit of presence into your routine, the easier it will come. With the joy of the holidays and the New Year ahead, let's try to focus on the present and experience every day. From my frantic world to yours, dig in! 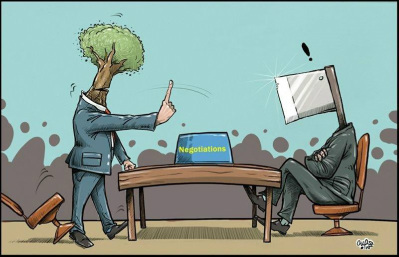 Negotiations can go bad in a hurry for any number of reasons - clashing personalities, inflated egos, misunderstandings, incompatible priorities, negative emotions. When things get rough, what's your go-to strategy to get things back on track? I find that taking a step back and detaching for a moment of self-reflection allows me to collect myself, view the interaction objectively and re-focus with renewed energy, perspective and purpose on the common interests (or goals) at the heart of the negotiation. Professor William Ury, of the Program on Negotiation at Harvard Law School, coined the phrase "go to the balcony" in his brilliantly practical book on negotiating with difficult people, Getting Past No. Ury challenges us to imagine negotiating on a stage and then imagine climbing onto a balcony overlooking the stage. The "balcony" is a metaphor for mental detachment. Daniel Goleman, esteemed expert and author on the topic of emotional intelligence, wades into the negotiation arena with thoughts on how "checking-in with your self-awareness" and "re-centering" can help rescue a flagging negotiation. Goleman's insights are drawn from an interview he conducted with George Kohlriesler, a negotiation expert and Professor of Leadership and Organizational Behaviour at IMD (the International Institute of Management Development) in Lausanne, Switzerland. For Goleman and Kohlriesler, success at the negotiation table begins with the establishment of strong and dynamic bonds with your counterpart. You may not like your counterpart, but you need to forge a foundation of respect, trust and collaboration to have negotiation success. Sometimes the bonds that have been formed fall apart, or perhaps haven't been solidly built in the first place. Kolhriesler suggests that in order to build or rebuild a bond, you must first check-in with your self-awareness and engage in an honest assessment of the emotions that are impeding a productive dialogue. Are there negative emotions? If so, what are they and how are they getting in the way? Once you've checked-in and re-centered, circle back to the common interests (or goals) that brought you to the negotiation table. Why are we here? What do we both want to achieve? Next, invite your counterpart to share their take on why things have unraveled. William Ury refers to this stage as "disarming" your counterpart by "stepping to their side." As Ury puts it, if you want your counterpart to listen to you, begin by listening to them. Ultimately, through active and empathetic listening the experts all agree that you will create a connection - a bond - critical to getting the negotiation back on track. Whatever label you give it - detaching, checking-in, stepping back, going to the balcony - the message is clear: the awareness and ability to take a mental break to regain your ballast is critical to re-focusing on the common goals that brought you to the negotiation table and creating the bond that will foster agreement.